With a roller coaster of a winter with temperatures going from -25 to 40 degrees and an overabundance of snow, this past week has been awesome for trail maintenance. All projects have been able to recover nicely and with not getting any storms this week, this has allowed projects to push back road crossings and work on signage. As we all know , this Friday is going to be the start of VACATION WEEK. If you want to have some nice riding and not much traffic, check out the green trails on the map. These trails are less traveled but still offer up some great scenes of Aroostook County. Trails in the Scopan lake area and the Easton area are always top notch but without the heavy traffic. Moosetown riders have the Beau and Glazier lake trails in great conditions. When going up ITS 92 on Saturday make sure you stop in to the Saint. Francis Sno Angels clubhouse for the great meal and on your way back from riding up in the Allagash stop in to the Two Rivers Restaurant. When going through Presque Isle on trail 88/83 you will notice the new bypass that is being constructed. This is one of the reasons why the County and the State of Maine have the best trails around. The MDOT and the Department of Conservation along with the Presque Isle snowmobile club worked out an agreement to allow the use of a Recreational corridor along this new road, this is another plus for the County. ITS 92: This trail has been in great shape all season long and continues to be. ITS 90: This trail continues to be in great shape. ITS 120: This trail is in great conditions and one of the most scenic rides in the County. Make sure you stop by Deboullie Mountain. ITS 83: reporting good conditions. The logging operation will be starting next week down in the Bridgewater area. The CASC will be working on the reroute. ITS 81: This trail is connected all the way through There is a logging operation on the section in Grand Isle please watch for signs. There is a logging operation where trail 98B and 81 intersect watch for signs. Madawaska is reporting good conditions. All clubs are out on their sections. ITS 105: This trail is in good condition from Van Buren all the way through to Scopan. ITS 88: From Fort Fairfield through Presque Isle, Aroostook River are reporting good conditions. Ashland is also reporting great conditions. If you want a scenic ride and you think that you are in the heart of the deep Maine woods the section of trail that runs along the Aroostook river is breathtaking and if you stop for a few minutes there might be an Eagle flying over. Trail 89: This trail is open to the Black Bear Lodge and connects with trail 102 which is the old trail 100 that Pleasant Ridge Riders maintains. From this intersection North to 94 still has not been connected. Caribou will put it on Social media when connected. Trail 94 is now open from Van Buren to trail 105, there are signs but few and far between, the club will be out putting more up, so please use caution. Trail 71A in Ashland is now open to the river, there is one mile of plowed road. Other than that this trail is awesome. Caswell is reporting good conditions. Trail 71D is closed for the season as there is logging, this is in the Grand Lake Seboeis area. Trail 81: Nordic Lakers are reporting excellent conditions. This is one of the trails that doesn’t get a lot of traffic. Presque Isle is reporting that they are out grooming day and night. Chapman is reporting great conditions. Easton Snowmobile Club is reporting their whole system is in great shape. Trail 73 and 73B is being maintained by Fort Kent and are reporting good conditions. There is a logging operation South of little black lake area, watch for signs. Central Aroostook Snowmobile club are reporting a lot of Moose traffic on the #9 lake trail and Rte. 70A. Number 9 lake trail is in good condition. The Rockabema Club is grooming ITS 81 to Oxbow today and will be out again tomorrow just making sure all is well for a busy weekend. 112 to Island Falls as well as Club Trail 62 are in excellent condition with no open water. Bowlin/Mattagamon/Shin Pond has had a very busy past weekend and is having to replenish their case of trail maps which is good for all of us. Conditions there are also excellent with all trails groomed and ready. The Benedicta Snow Gang reports ITS 83 from Sherman to Whetstone Falls and ITS 81 covering Sherman, Benedicta and the Mattawamkeag Cut-off are excellent. Municipal trail 70 from Benedicta to Whetstone Falls is closed due to logging. The Snow Gang will be holding the Plunkett pond Fishing Derby on Feb. 24 from 7-3. Call 745-0863 for more information. Molunkus Valley Snow Drifters covering ITS 83, 83A and Bible Point have the trails prepped and ready to go for the weekend. 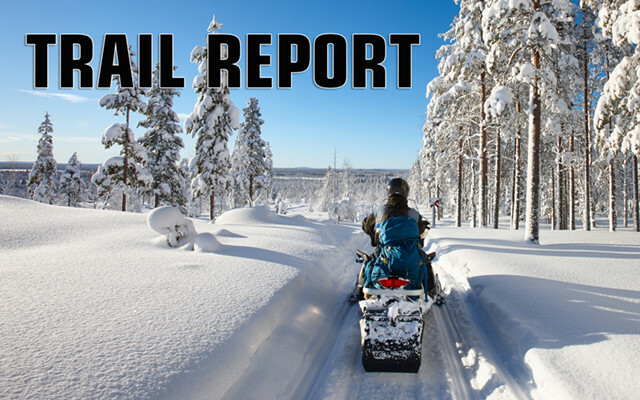 The Big Valley Snow Club covering Birch Point/Island Falls area has groomed ITS 83 north, 60 to Oakfield and ITS 83 South to Sherman and report that the trails are in excellent shape. The Meduxnekeag Ramblers of Littleton have groomed the rail bed ITS 83 North to Monticello as well as ITS 86 South, Littleton to Hodgdon. Club Trail 81 is also ready and all are in excellent condition. ITS 86 to St. Croix Stream is also groomed. The Club is also hosting their Saturday breakfast at the Littleton Clubhouse on the Wiley Rd. from 6 to 9 on Saturday. Linneus Sno-Sports – ITS 105 from Hodgdon to ITS 83 to Oakfield has been groomed and trail conditions are great. Easter Maine Snow Riders has completed 3 and 3A as well as ITS 110 to Macwahoc. With the warm weather they report some water opening on the sides of the trails but overall the conditions are excellent. The bridge in Macwahoc is now open and passable. The Oxbow Masardis Snowmobile Club reports that ITS 85 was groomed yesterday and last night and is in good condition. ITS 86 has been groomed and is good condition and 71-A Trail Oxbow to Ashland is open. Presque Isle Snowmobile Club Stew night this Friday starting at 5 at their Clubhouse. St. Francis Sno Angels Will have their clubhouse open on Saturdays from 11-7. Carter Brook Snowbirds snowmobile club will be having a Chicken Stew and Ployes supper Saturday the 17th of February. 4:30-7:30. Washburn Trailrunners Clubhouse is open for the season. Friday’s hours are from 8-12; Saturday 7-2; Sunday 7-12. Portage Lakers will be having their annual pie auction at Dean’s Motor Lodge on Saturday February 17 at 7 p.m.